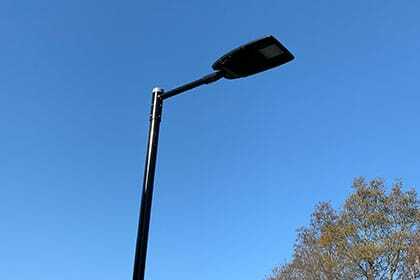 Does your Car Park Lighting Comply with British Standards? Paul Hunt Electrical Installations handle everything from consultation to installation. It’s important that you upgrade your existing systems to ensure that they comply with the British Standards BS EN 12464 and BS 5489:2013, which states that car park lighting is safe, even and consistent. Our team can help you establish the most cost-efficient solutions to comply depending on the size, location, type of premises and the number of visitors. Floodlights, Bollards, Border/Perimeter columns or bay mounted columns. Our team of experts will work with you to chose the best design to fit with the overall aesthetics of the car park, whilst advising on costs and safety. Light traffic – 5 Lux (Convenience Stores, Apartments) – Residential private carparks must comply in accordance with police initiatives to ensure lighting is safe, even and consistent. It’s important to carefully consider where you will place the lighting and how many installations you will use. Although you must ensure the car park is safely lit, it’s important not to cause obtrusive light. Obtrusive light could be a glare or excessive light intruding on another property. Strategic placement of your lighting will save you money and prevent complaints. It is also necessary to ensure that entrances, signs, and hazards are clearly visible without compromising on the overall lighting. Additional features are often very efficient in the long run, in terms of costs and energy. Controls and dimmers allow you to lower lighting levels during quiet parts of the day/night. In regards to safety, white light works better to provide a clearer image on CCTV. It’s essential to keep visitors safe when they are on your premise. Light Emitting Diodes (LEDs) provide you with a solution that saves you time, money and energy. LEDs are versatile and efficient. They are a solid source and have a much longer life than traditional light bulbs. In fact, LEDs can last up to 30 years or 50,000 hours.